Tomáš Pfeiffer is a Czech philosopher, healer, biotronicist. He is the disciple and entrusted successor of the philosopher and founder of Biotronics, Mr. Josef Zezulka (1912 – 1992). He established TOMÁŠ PFEIFFER - DIMENZE 2+2 Praha Publishing House aimed at publishing and distributing philosophical works, particularly those of Josef Zezulka. 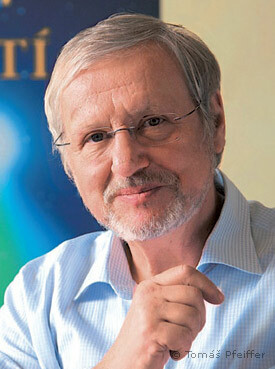 In the first half of the 1990s, Tomáš Pfeiffer became widely known for the Seance TV programme broadcast by Nova TV. Moreover, he participated in many other radio and TV programmes. He worked in the committee for alternative medicine under the Minister of Health of the Czech Republic and held the position of spokesman for the Czech Association of Professional Healing. He gave rise to the Foundation of Josef Zezulka through which the house of Biotronic Centre for Social Support is being built and operated. It is the seat of the Spiritual University Bytí, established in Prague on 30 March 1994. Its lectures are held all over the Czech Republic and are broadcast live by means of BIOVID TV stream on www.dub.cz. He is the statutory representative of the professional chamber Sanator – the Union of Biotronicists of Josef Zezulka, which is in charge of appointing and educating aspiring biotronicists and guarantees the professional standard. The chamber is a member of the EU Health Policy Platform. Furthermore, he publishes books, periodicals, CDs and DVDs, and writes on a regular basis. He is the representative of the spiritual-religious society The Society of Josef Zezulka being the 38th state-registered church. He is a sponsor of arts, organizes regular exhibitions, and is also involved in photography, filming and film production. As a traveller, he is devoted to studying foreign cultures. Tomáš Pfeiffer organizes multimedia concerts entitled The Common Interest featuring the historical instrument Aquarius Bell. More than 400 concerts entitled The Common Interest took place between 2007 and 2017.